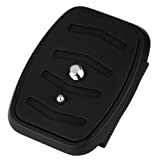 Replacement quick-release plate for the Star63 tripod. This entry was posted in Discount Photography and tagged 61/62/63, Hama, Plate, Quick, Release, Star, tripods, Videopin by Ball Photo. Bookmark the permalink.